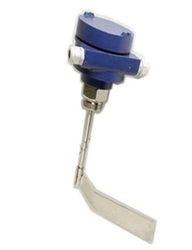 Pioneers in the industry, we offer rotary paddle level switch from India. We have Rotating Paddle type Level Switches which are recommended only for dry mediums like powder, granuls, pallets etc. Output: 1 sets of potential free c/o contacts rated at 5 amps, 230 V AC for non-inductive loads. Switch status display:Green LED shows Normal, Red LED shows alarm condition. Paddle : 1 – 4; Paddles depending upon application.